Register Now to join in the excitement and outstanding Scouting program at the next Pack event. Otherwise, feel free to request more information anytime by using the "Contact Our Pack" link. Pack 487 is located in Forest Lake, MN and chartered by St. Peter's Catholic School. We typically have 20 to 30 scouts annually and we are always looking for more. Our pack is most active throughout the school year, but many of our Scouts participate in summer camps, 4th of July Float building, and Scout day outings to Base Camp, Valleyfair, Twins Games, Wild Mountain, Como Zoo, Minnesota Air Guard Museum and more. Scouting is a family event as our pack meetings show. If your child is interested in meeting fun new friends, learning new and interesting skills, interacting with the world around him, and involving his family with a great group of other fun families, this is the place to be. Contact any committee member or den leader to get started on your scouting journey. January: CHAOS on the Lake: Rockets, Ice fishing, boot hockey and more! August: Rest and get ready for another year! Other activities have included: attending Twins, Timberwolves, Swarm, and Wild games; Monster Jam (monster truck show); swimming at Shoreview Community Center waterpark and more. We are always looking for fresh new ideas to provide scouts and their families with different experiences. Dues are $37 and we ask the boys to sell 12 wreaths to make up the difference plus 8 more to cover Kiwanis Camp. The Wreaths are well received in the community and the boys learn interpersonal and sales skills, but there is a buy out option for families that do not wish to participate. Our Pack usually meets the Third Monday of the Month with several exceptions (back to school night, Pinewood, Camping, etc) and the whole family is always invited. 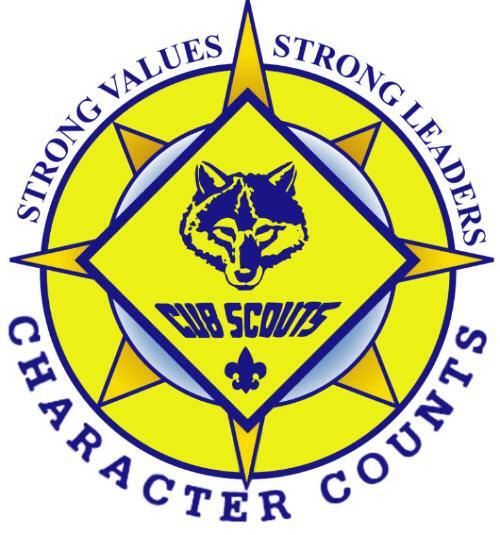 The Scout Den times will be announced at our Kick off meeting / Back to School night, but usually one evening a month the Scout and his Adult attend and work on age appropriate skills. 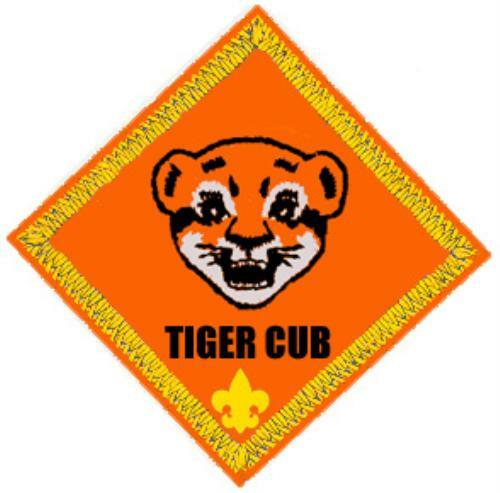 Cub Scouts is an organization for boys in Kindergarten through fifth grade (or ages 5-10). Members join a Cub Scout pack and are assigned to a Den, usually a group of six to eight boys. First grade boys (Tiger Cubs) meet once a month, while Wolf (second grade), Bear (third grade), and Webelos Scouts (fourth and fifth graders) meet twice a month. 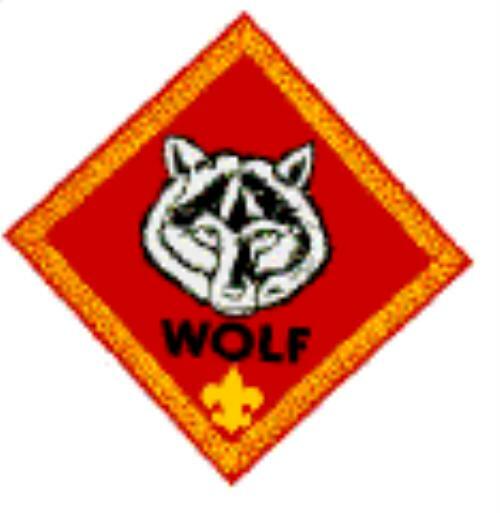 The pack refers to all boys in Kindergarten through fifth grade which belong to our cub scout group. The pack meets once per month during the school year (September through May) usually around the third Monday of the month, although some activities are best suited for Saturdays. 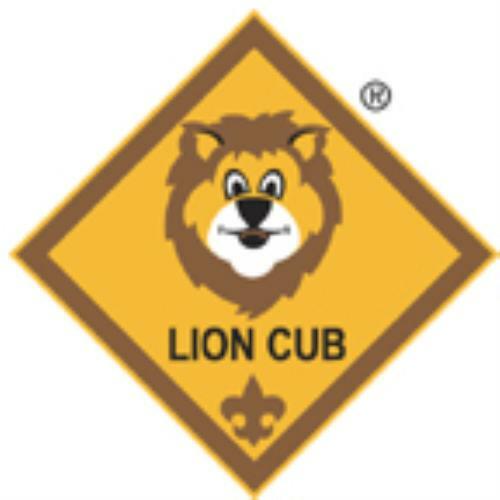 Lion Cubs is a new Cub Scout program for boys age 5 or in Kindergarten and their adult partners. The program is focused on parent involvement and delivery with support from the Cub Scout pack using literature specifically designed for the younger age group. Each month’s curriculum includes Family/Den Activities, At-Home Activities and Grand Adventures. Tiger Cubs are first graders (or age 7) and an adult family member. Tiger Cubs members take turns planning and hosting den gatherings, selecting projects from a broad range of suggested activities. You and your son will both learn as you go! Bobcat, the first rank, is for all boys who join Cub Scouting. 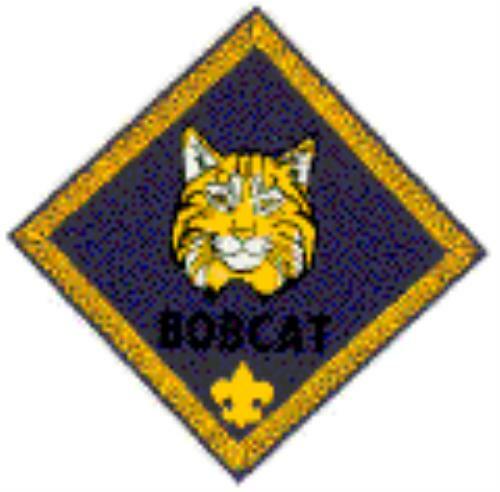 To earn the Bobcat badge, a Cub Scout must learn the Cub Scout motto, promise, handshake, salute, and sign. This is typically a very short held rank before moving on to Wolves. Wolves is the program for boys who have completed first grade (or are age 8). 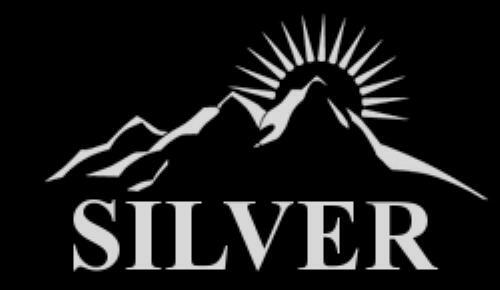 To earn the Wolf badge, a boy must pass twelve achievements involving simple physical and mental skills. Most, if not all will be presented in Den meetings and pack meetings. Bears program is for boys who have completed second grade (or are age 9). There are twenty-four Bear achievements in four different categories. 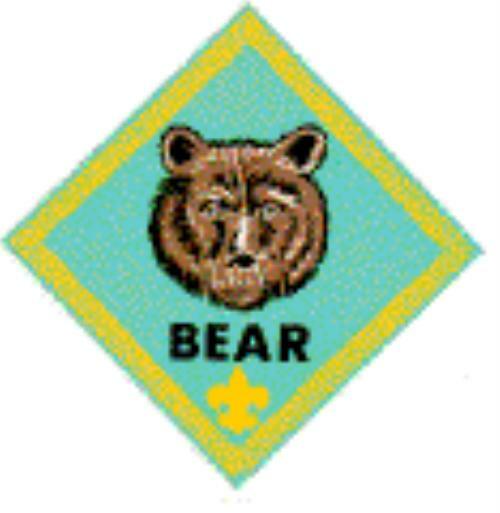 The Cub Scout must complete twelve of these to earn the Bear badge. These requirements are somewhat more difficult and challenging than those for Wolf rank. They are also addressed in den and pack meetings. 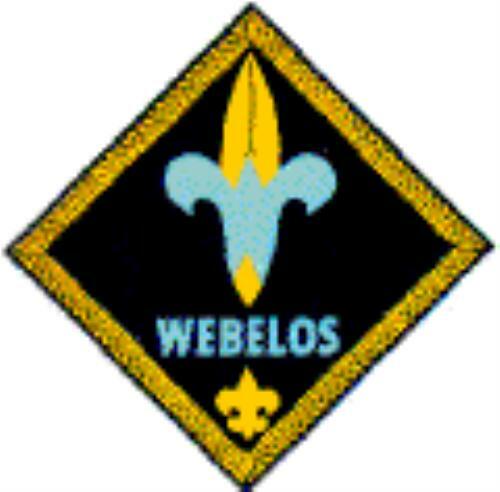 Webelos is the first step in a Scout's transition from a Cub Scout Pack to a Boy Scout Troop. It is for boys who have completed grade three (or are age 10). As he completes the requirements found in the Webelos Scout Book, he will work on activity badges and become familiar with the Boy Scout requirements - all leading to the Arrow of Light Award. 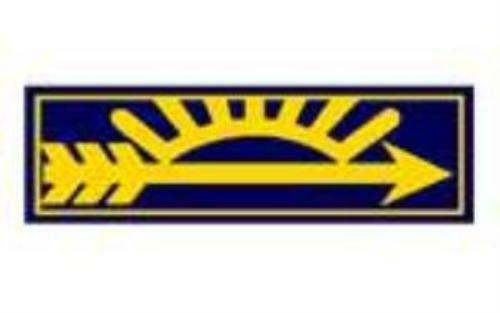 Arrow of Light for the oldest Cub Scouts, the Arrow of Light program offers 5th grade Webelos the opportunity to earn the highest rank achievement in Cub Scouting that transfers to their Boy Scout uniform. By earning this recognition, a scout demonstrates he is ready for the next step on the Boy Scout trail. During their last year in a Pack, Webelos get a larger say in which adventures their den will do, and in leading their fellow scouts, both skills that will come in handy in Boy Scouts. A boy that is new to Scouting in 5th grade does not need to earn any previous ranks. He can earn the Bobcat badge and then the Arrow of Light along with his den, even if he does not have the Webelos badge yet. If it's important to him, he can put in more effort and fulfill the Webelos requirements during 5th grade also, without missing out on the adventures his den is doing for Arrow of Light.